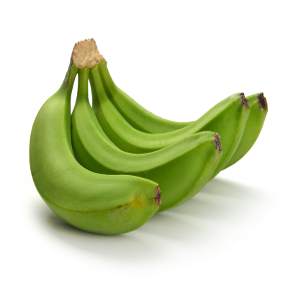 Green Bananas are simply the green, unripe versions of yellow, ripe bananas. They are less sweet tasting than ripe bananas, and are uniformly green rather than yellow and/or brown. While you can eat the yellow banana immediately after peeling, the green banana is best eaten cooked, either boiled or fried. Although they can be eaten raw instead of ripe for their nutritive benefits. Nutritionally, the green banana is a good source of fiber, vitamins and minerals, and contains a starch that may help control blood sugar, manage weight and lower blood cholesterol levels. Names: Green Bananas, Raw Bananas. Handling: Green Bananas are boiled, steamed, mashed, fried, and baked in dishes around the world. To remove the peel, use a knife or a peeler. Choose raw bananas that are green, firm, and free from blemishes. Use them immediately or they will ripen, or store chopped or grated in the refrigerator. Cooked raw banana will last properly stored in the refrigerator for up to two days.